Designed for crossovers, vans, SUV's and full size pickups. The Wild Spirit Sport HXT takes to the road with smooth ride comfort, all season traction performance and high value in mind. 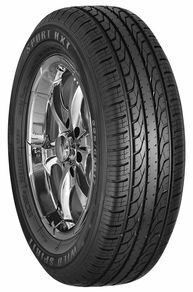 For drivers seeking a combination of touring tire longevity, performance tire handling and light truck tire durability, the Wild Spirit Sport HXT answers the call. If you have any questions about this product by Multi-Mile, contact us by completing and submitting the form below. If you are looking for a specif part number, please include it with your message.